Saving the first $100K is a hurdle that once we achieve it, our life gets easier because of the compounding effect. There is another savings target which if we achieve that early in our lives, we can actually stop saving for the rest of our lives and still be able to retire quite comfortably. 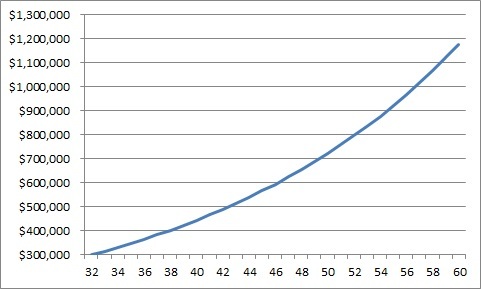 The x-axis shows the amount and the y-axis shows the age. The assumption made for this chart is a 5% investment return consistently for every year and all profits are reinvested. There are no additional savings injected into the portfolio, the money grows just because of 5% investment return over the period of years. 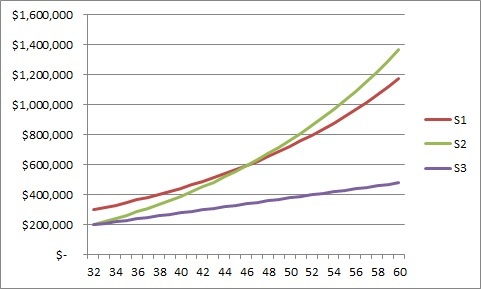 As we can see, if we have $300K at the age of 32, we can actually grow our money to $1 Million somewhere at the age of 57 even without saving a single cent after the age of 32. We can continue to work and spend all the money we earn but still can achieve $1 Million in savings at retirement age. This doesn't even include our CPF savings yet which most of us will have another few hundred thousand dollars for retirement. It is amazing how the power of compounding works to achieve that $1 Million even without additional savings. However, many of us may be thinking how do I even save that $300K at age 32 to begin with? I admit this is not an easy task and I personally won't be able to achieve that since I'm only just 2 years away from age 32 and I am nowhere close to $300K in savings yet. To save $300K by age 32, assuming most of us start work at the age of 25 or 26 after graduation, we will need to save close to $50K a year. This is almost impossible for a fresh graduate salary since most don't even earn $50K to begin with. In view of this, I will tweak the scenario a little which should suit most of us. Now, the savings target at age 32 is lowered down to $200K. Because of this, it is impossible to achieve $1 Million by retirement age without any additional savings so there is an additional $10K of savings added in per year. With the same 5% investment returns and the additional $10K annual savings, we can now still get a decent Million dollars for our retirement. Saving $200K by age 32 should still be achievable. With this, it sets the new savings target which I aim to achieve bearing in mind the expenses which I need to incur for a new house, renovation, marriage and more. Thereafter, we actually do not really need to save that much anymore if we can get a 5% investment return which shouldn't be too difficult to achieve. That additional $10K savings annually is just an average of less than $1,000 savings per month. A person who does not invest at all only manage to save $430K at the age of 55 vs $1M at age 55 for a person who invests. This is why investing is so important for long term savings goal while reaching a substantial savings target is important early in our life. Visualisation helps us plan for our finances better. I mainly use excel to tabulate the numbers with simple formulas and charts to visualise the outcome. I would say excel is a really good financial planning tool. From the visualisation above, we can see having a savings target and an investment return target are both important. It is also important to run the numbers and make sure we are comfortable with it. Financial planning is all about making sense of it and asking ourselves is it practical and achievable? For example, we would want to be setting a investment target of 10% and think it is easily achievable over the long run. That would be quite difficult for most people. Have you ever struggled with the thought of saving more money for financial independence vs spending to get happiness now? For people like me who are on the journey to financial independence, we often think that if we don't spend more on some items we wanted to, then we can achieve financial independence earlier. Its always a trade off for saving money vs spending to get happiness. In recent weeks, the conflict of saving money vs spending to get happiness right now is constantly on my mind. It went on into a state of confusion and anxiety as well. I have been a saver all my life and spending more money on something which I don't think is valuable affects me a lot. The numbers run through my head and my mind keeps thinking what if I didn't spend this amount? Will this affect my plan of financial independence? I chanced upon a podcast which was a conversation between 2 people who had achieved financial independence early in life. They both had enough passive income to live their life in their late 20s and early 30s but it was through extreme saving and investing. In the podcast, they were talking about the regrets they had because they turned down friends gatherings and forego trips just to save more. After they achieved financial independence, they looked back in their life and felt lots of regrets for sacrificing so much early in life. Another thing which caught my attention is that they also mentioned the motivation for achieving financial independence early is because of anxiety. This is the anxiety that money is not enough and they wanted more to feel secure. To think of it, actually my motivation for achieving financial freedom is also because of anxiety. This made it very difficult for me to spend money unnecessary without comparing prices to get the best deal. Even when I tried to live away from a budget, mentally in my mind, the numbers are always there and when I spend a little more, my mind would give out an alert. I have also lived with the notion that money does not buy happiness and spending unnecessary on material goods does not give lasting happiness. However, in actual fact, money does buy happiness especially when we spend on experiences with people. It also builds relationships and create memories of a lifetime. Spending a little more doesn't hurt? If money does buy happiness and can create memories, so spending a little more doesn't hurt right? I am still trying to learn this part where I just spend money without thinking about the trade off for financial independence. In fact, spending a little more doesn't really deviate myself from the financial plan. Instead of focusing on how much more I can save, I should focus on what I can spend more meaningfully on. This doesn't apply to everyone. If you're already spending close to 100% of your salary, then you should be focusing on saving more. For those of us who are already saving perhaps more than 50% of our income, then it may be good to review our expenditure to spend a little more on meaningful things. What about financial independence if I spend more? Now, spending a little more doesn't hurt but does it affect our goal to reach financial independence? Or maybe I should put it in another way, if we can't reach financial independence earlier, then does it matter if we reach it later? Many financial bloggers have wrote about how they saved more than 100K in their 20s. More often than not, this is done through lots of sacrifices unless we have a high income which is not the case for most people in their 20s. I used to save even on drinks and food just to save that extra few dollars. Looking back, maybe if I didn't do that, it wouldn't hurt much also. I would think there are some regrets which I had, living a life of fearing to spend money. As my income grows, spending money is not as painful but there are still conflicts in my mind on this when it comes to certain spending. In the podcast which I was listening to, it was also mentioned that one of them couldn't bear to spend $13 on breakfast when on the same morning she got a $6000 cheque for a side hustle. Its really not about how much money we have or earn but the mindset that we have. Never in my life would I have thought that the ability to spend more could be as bad a problem as the ability to save more. We have often heard of people who can't control their spending but not much have been said of people who do not spend a lot. For our own life, I always believe there should be a balance. Life is short so spending some money on people we love is really a privilege. We may not have a chance in the future when they are gone. 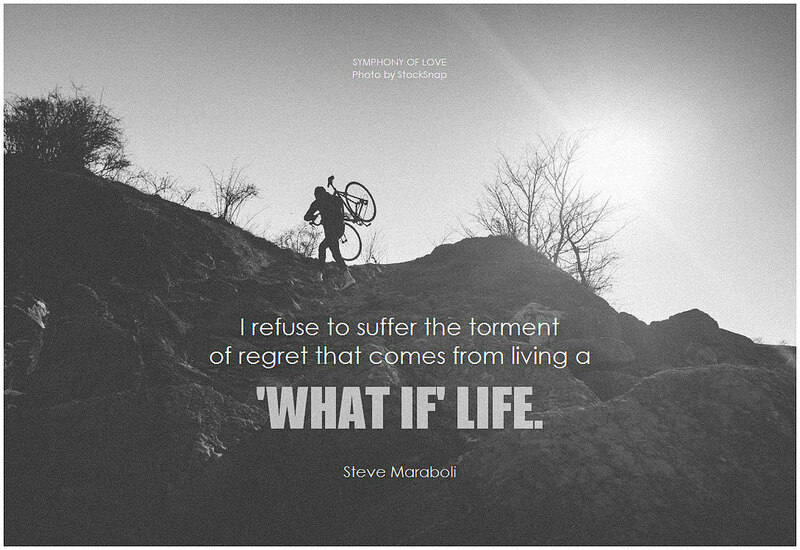 There will be lots of regrets by then. INVEST fair has been a yearly affair ever since I started investing 8 years ago. 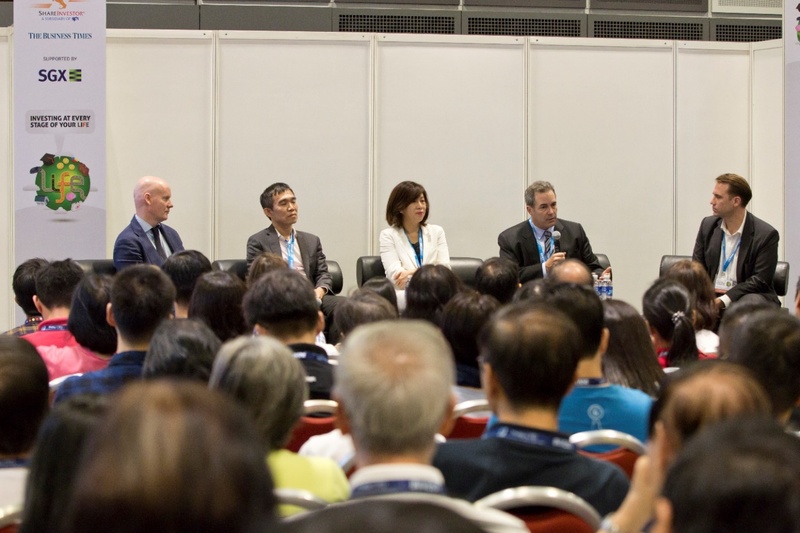 I attended my first ever INVEST fair at Suntec City many years back and it really opened me up to the world of investments as there are many free talks and also booths around for me to ask any questions which I might have on finance and investment. This year, INVEST fair is back again at Suntec City which will be held from 25-26 August 2018. Admission is free and all seminars are free to attend too . INVEST Fair is ShareInvestor’s annual flagship event with the purpose to showcase products and services in the market, to act as a meeting point for investors and traders alike and to keep the attendees abreast with the latest market outlook. There will also be 3 x lucky draw chance for readers of SG Young Investment. Do read to the end of this post to find out how you can take part in the lucky draw. I will briefly write about some of the interesting topics and also the speakers who will be delivering it so you can check it out later. This topic is presented by Tam Ging Wien from ShareInvestor Academy. He has been an avid equities and real estate investor for over 10 years. In 2017 he published his first book entitled REITs to Riches: Everything You Need to Know About Investing Profitably in REITs. I think this is really relevant for investors especially if you are investing in REITs. The rise in interest rates will affect REITs but do you know how much your investments will be affected? I'm a fan of macroeconomics and this topic will certainly be of interest to me. Most of us would have heard of The Motley Fool. They will be holding a 30 mins Q&A session at INVEST fair where you can ask their team any questions related to investing. The panel includes some of their top analysts so just shoot any questions which you might have and I believe you will learn some good stuff from them. The next topic which caught my attention is on trading. I started off as a trader and tried to learn everything from reading charts, to psychology to candlestick patterns and all the Fibonacci techniques etc. However, I grew to learn that trading is not really for me but it can be suitable for some people. I've personally seen certain people around me who can trade rather well because it suits them very well. For those who want to know more about blockchain and cryptocurrency, this should be the topic for you to explore on. To be honest, I do not have much knowledge on blockchain or how I can invest into this new space. Its not easy to learn online so probably if we can listen in person, it would be much better. This topic will be presented by Darren Koh, who's a strategist from Tokenize Xchange. Darren has been an enthusiast of the space since 2016. At Tokenize, he is the man behind strategies and is passionate about what the blockchain has to offer. A purveyor of blockchain technology, Darren is always educating others on what this new trustless data structure can accomplish and is also building the Tokenize blockchain. There is another similar topic on the new tokenized economy for the future which will be presented by Davy Goh from Bcoin Exchange. As the founder of BCoin and an outspoken blockchain and cryptocurrency evangelist, Davy is responsible for its overall success. A motivated leader and serial entrepreneur, Davy has a proven management track record and brings a wealth of knowledge and expertise in corporate financial strategies and management. This will be a good topic to hear on how blockchain will be used for the future. Crowdfunding may be still new to many investors out there but it is actually a viable alternative way to grow our money with higher returns. Of course, with higher returns, most of the time it comes with higher risk as well. This topic will focus on SME loans which I have invested in several times through the Moolahsense platform. I've invested in 4 different loans and so far all has been successful with returns of 13.50% to 18%. Because of the higher risk nature, I evaluate the investment choices really carefully and make sure I manage my risk well. I only invest a small portion of my investment capital in SME loans for now. Lawrence Yong, CEO and Co-Founder of Moolahsense will talk about compound your returns by auto-investing in a portfolio of SME loans. Before founding MoolahSense, Lawrence was a Vice President at Macquarie Capital where he was closely involved in developing its sales and structuring business at the Fixed Income division. You can refer to more information on their website here. Do check out the exact date and time for the different seminars available under Agenda -> Seminar Schedule on the website. *Additionally, ShareInvestor has kindly given SG Young Investment's readers 3 x lucky draw chance when you enter the promo code - SGYOUNGINVESTMENT when you register. Remember to enter the promo code when you register for FREE for this event. Click here to register.